I have already discussed about a few chapters necessary to get into AVR programming. Now this is the first article that deals with programming.Â Let us start with the basics. 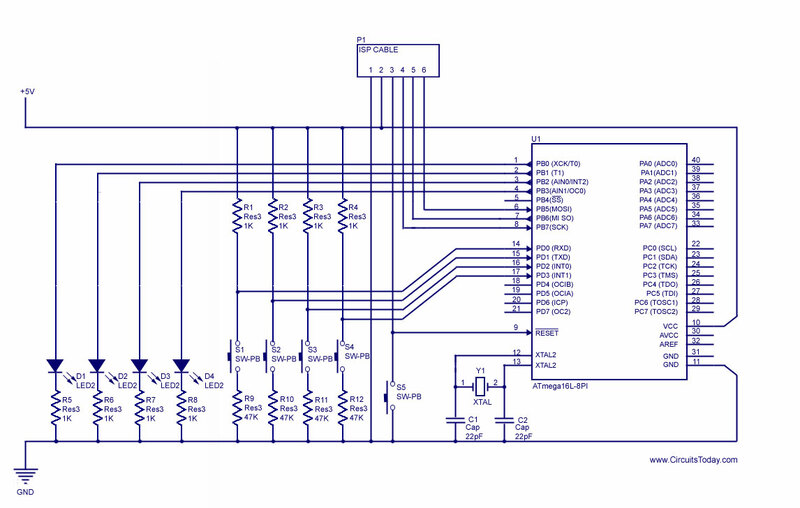 Digital input output (I/O) is the basic feature supported by Â AVR micro controller. To facilitate digital input output, three registers are associated with each port of the micro controller. Data Direction Register– This register determines which of the pins will act as an output port, and which of them as input. Data Output Register-This register holds the Data output to the port. Now let us look into an example. For Port A the three registers are- DDRA, PORTA & PINA respectively. Similarly for port B, it will be- DDRB, PORTB & PINB. Now before going to further discussion, there is Â one important thing I should mention. One port serves for more than one purpose. It is the designerâ€™s responsibility to eliminate every possible error. If the program and system are not designed carefully, fallacy may appear. 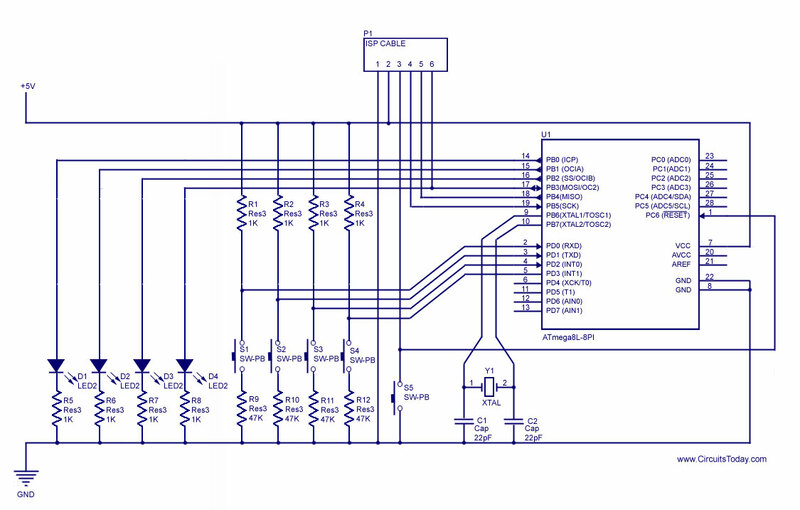 Note: Click on the circuit diagram to get a large and clear view. Program 1: Basic Program Showing Digital Output functionality. This program consists of two simple statements, including one delay loop. The â€˜~â€™ symbol stands for bitwise not operation. Here CPU operating Frequency must be defined for proper implementation of the delay loop, and it has to be declared before the â€˜delay.hâ€™ Â line in the C code. HereÂ I’veÂ used the #define F_CPUÂ 1000000. There is another option available to define the CPU Operating frequency. In Avr Studio, go to â€˜Project Menu> Configuration Options> Generalâ€™. Here you can choose your device model and its operating frequency. Â As Iâ€™ve previously discussed, The Data direction register must be set up before doing any input/output operation. The LEDs connected to Port B blinks with 3 second time period. Note: All the HEX files given in this article are converted to RAR format (for safety and size reduction purpose). To get the HEX file as such – you may download each Â file and EXTRACT it to your computer using Winzip or Winrar. Program 2: Basic Digital Input functionality. Before, Iâ€™ve discussed how to put data into a port configured as an output port. Now let us see how to take input! To read output from a port, we use â€˜PINXâ€™. Where â€˜Xâ€™ ix the designation of the port. Remember, we put output using the variable â€˜PORTXâ€™ variable, but we read input using â€˜PINXâ€™ variable. For a particular port, these two variables have different addresses. If you write â€˜PORTX=PORTYâ€™ it means make the output of the port â€˜Xâ€™ equals to the output of the port â€˜Yâ€™, and notÂ the input. If a button is pressed, LED corresponding to that button will light up. Program 3: Stepper Motor (4 Coil) Driving Sequence. So if this sequence is generated at a port, a stepper motor can be driven using that port. In my program, an array of characters are declared first, and they are put into a port sequentially and repetitively to drive a stepper motor. A delay loop is also used. It helps to control the speed. The LEDs on the board will be sequentially turned on and will repeat the sequence. Each LED would stay turned on for 1 second. After that, LED next to it will turn on up, and so on. The first LED turns on after the last LED. Program 4: Key input with Debounce. Key de-bouncing means taking a clean input from a key/button by eliminating false signals generated by electrical noise and transient electric signals. One of the most popular methods of debouncing technique is to recheck the key after few moments. Â Â In the program above, after taking an input, it is checked if any key is pressed! If pressed, after 100mS, the keys are read again. If both of them are equal in value, the LEDs, corresponding to the key(s) pressed, are turned on. Initially, all the LEDs will stay off. If any key is pressed, Corresponding key will glow. If new key is pressed, the LED, corresponding to that key/button will glow and the previously on LED will go off. Multiple keys can also be pressed; in this case, multiple LEDs will glow. You can use these two files (PDF) for further reference in Handling the Digital Input-Output in Atmega32 and Atmega8. How do I control two LED’s with one push button , there’s always some error . The crystal and the capacitors together make a Colpitts tank circuit for frequency generation. sir what is the use of 22uf capacitor below crystal. 🙂 It was nice to see all of you. I’d be glad if you benefit from my articles.